This being my blog and no one else’s, I can go off at a tangent if I feel like it, and every now and then I like to throw in my interest in modern (veering on the experimental side) guitar music. Happily, a number of guitarists on the cutting edge of things have dabbled with accompanying silent films, admittedly with some mixed results. The leading exponent is Gary Lucas, and it is upcoming activity in the field that is the reason for this post. Lucas is best known in rock music circles for playing for Captain Beefheart’s Magic Band in its latter years (the Ice Cream for Crow years) and for his close association with Jeff Buckley. The extent of his musical activity is almost as bewildering as his quick-fingered skills, and this has included two forays into accompanying silent film, with which he has toured extensively. Sounds of the Surreal combines René Clair’s Entr’acte (1924), Fernand Léger’s Ballet mécanique (1924) and Ladislaw Starewicz’s The Cameraman’s Revenge (1912). His splendid score to The Golem has been showcased widely – though not, surprisingly, at any silent film festival, so far as I am aware. There’s a YouTube extract from his score (which might change a few expectations of what a guitar score can sound like) to the film, and four parts of a 1998 Slovenian documentary (with Lucas interviewed in English) on the film and his interpretation if it, here, here, here and here. And now there is news of two new silent film scores, accompanied live by Lucas, happening this year. In mid-April his score for the Lon Chaney classic The Unholy Three, commissioned by The Film Society of Lincoln Center, will have its premiere at the Walter Reade Theater in New York City in mid-April. Then the Holland Festival has commissioned a new live solo guitar score by Lucas in collaboration with Dutch-Iranian composer Reza Namavar and ensemble for Abel Gance’s J’Accuse which will have its premiere live mid June in the Amsterdam Stadtsshouwburg. 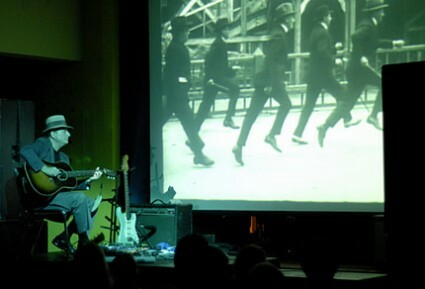 How well does the guitar (and it’s usually the electric guitar) go with the silent film? The jury’s out on this, as those guitarists who have taken on the task have varied in the degree to which they have accompanied the film or the film has accompanied them. At its best, the electric guitar can bring colours and expressions that illuminate the films without dominating them (with a tendency towards ambient sounds). At its worst you get music inspired by the film that doesn’t connect with the film in a live content in any meaningful way at all, and which sounds too thin to take on the weighty task of accompanying a film drama at its fullest. Only last month Scottish acoustic guitarist David Allison played to Murnau’s Nosferatu (1922) at the Glasgow Film Festival (see interview with him here). Let me know of other examples, if you can. An interesting idea. Why, if there’s only one instrument to accompany a silent film, must it always be a piano? But it has been this way for a long time, with few exceptions. We even find the piano-with-silent-film idea fictionalised as early as 1902 by George Sims in his story, ‘The side-show pianiste’. Maybe some major festival, e.g. Pordenone, will try to have a guitarist improvise for some films sometime… It might be a chance to break a convention which has become almost set in stone. Having given us harp with silent (Little Old New York) last year, I’d like to see Pordenone experiment with guitar too. Nothing will replace the piano for reliability and versatility (not to mention the considerable skills shown the present crop of silent film pianists), but I think it’s important to keep on experimenting, testing the silents wiith new sounds, and in new environments. Last year, in San Francisco, Black Francis from the Pixies and a full band played live in front of The Golem. (Decent review at cinematical.com that gives more details & a fair summing up.) I wouldn’t have missed it, but it wasn’t so much a soundtrack, as music inspired by, and they did clash a bit, I thought. thanks again for highlighting the guitar’s rise as a scoring instrument. Happy to oblige. I really like the effect you achieve, which looks to have suited the film very well. Interesting that it is improvised too, and that you are led by both film and audience – as one finds with improvising silent film pianists. Dreyer it is said didn’t want the film to be shown with music, which was a little impractical of him. 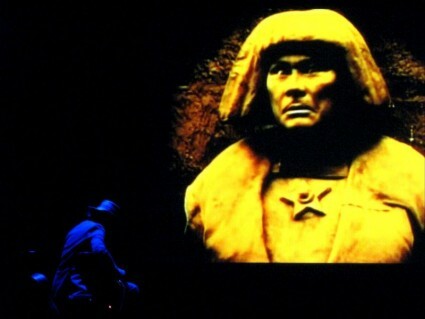 Gary Lucas is playing to The Golem at the Malaga Film Festival on June 26th – http://garylucas.com/www/blog/2009/04/road-never-ends.html (it’s a long post, the news is towards the end).